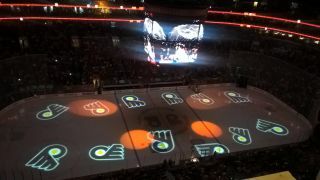 Working with partner and audiovisual integrator Riverfront AV, the Philadelphia Flyers have installed an on-ice HD projection mapping system that utilizes PureLink equipment at the NHL team's home venue, the Wells Fargo Center. The video content, played at different times during the games, aims to motivate the crowd as part of the modern sports fan’s media-rich and increasingly immersive live event experience. This 20,000-plus seat, multipurpose indoor facility is currently owned by Comcast Spectacor, which also owns the Flyers. A single-fiber transport solution was critical for this design to ensure that the 4K signals from the media server reached the projectors without degradation. It was also essential that the fiber cables and wires delivering these signals be strung safely and in an unobtrusive fashion as large groups of people would constantly be moving from one area of the facility to another. Additionally, Riverfront AV needed a quality matrix switch to ensure consistency and reliability of the signals, as well as a manufacturer whose technical staff and rep personnel would be available during the full scope of the process. “We've worked with PureLink before and we knew that they understood the realities and critical timelines involved in these applications,” said John Donlevie, Riverfront AV’s VP of operations. PureLink's flagship PureMedia line of matrix switchers has been used for more than a decade in corporate, government, and medical facilities. Riverfront AV decided to install a PureLink PM16x matrix switcher to feed 4K video to the arena's eight laser-fired projectors, with signals delivered over a PureLink fiber optic backbone. “PureLink is a solid manufacturer, and I felt very comfortable from the very beginning choosing them for this application,” Donlevie said. “They had a good mix of solutions at a workable price for this project."